John Adams (1735-1826) was a Massachusetts lawyer, colonial politician, revolutionary delegate, American ambassador to Britain, first vice president of the United States under Washington and its second president. Adams was born in Braintree, rural Massachusetts to a family descended from Puritan settlers, Adams was educated at Harvard and graduated as a lawyer before starting his own practice. In 1764 he married his cousin, Abigail Smith, a union that proved to be close, affectionate and durable. Those associated with Adams recalled him as hard-working, unfailingly honest and always prepared to speak his mind. For much of his early life, Adams felt frustrated by class distinctions. A member of the middle class, he experienced barriers and discrimination during his time at Harvard and as a lawyer in private practice. A keen observer of men and politics, Adams became interested in the debates over colonial taxation and representation. In late 1765 he urged a meeting in his hometown of Braintree to voice their opposition to the Stamp Act. Adams also published several essays criticising British policy, the best known of which was Novanglus (1775), which voiced objections to British policy in America on legal and constitutional grounds. 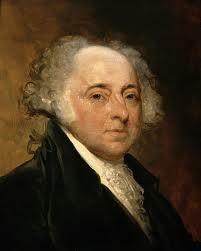 Adams became a strong advocate for colonial rights and self-government. He was much less radical and passionate than his distant cousin, Samuel Adams, always preferring to base his views on the evidence before him. This was demonstrated by Adams’ decision to represent British soldiers charged with murder in the wake of the Boston Massacre (1770), a case he gave his full attention. The acquittal of the British captain and most of the soldiers involved was largely down to Adams’ rigorous investigation and cross-examination. Adams later served as a delegate to the first and second Continental Congresses (1774-75). By the second of these congresses, Adams’ own views had hardened and he began to lobby for a declaration of American independence. He later served on the five-man committee responsible for drafting such this declaration (though Adams left much of the work to the more talented Thomas Jefferson). 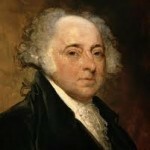 Adams made some important contributions during the Revolutionary War, serving as a legislator, an organiser of war material, a peace negotiator and a foreign diplomat. He was twice sent to Europe, first to secure a military alliance with the French and then to seek financial support from the Dutch. Adams also led the American party that negotiated the Treaty of Paris (1783) and two years later was appointed the first United States ambassador to the royal court of Great Britain, an awkward duty that he negotiated well. Adams returned to America in time to witness the ratification of the Constitution, a development he had enthusiastically supported from London. He served as the nation’s first vice president under Washington, then one term as its second president.